Happy New Year! Like everyone else, I'm on a health(ier) kick right now. 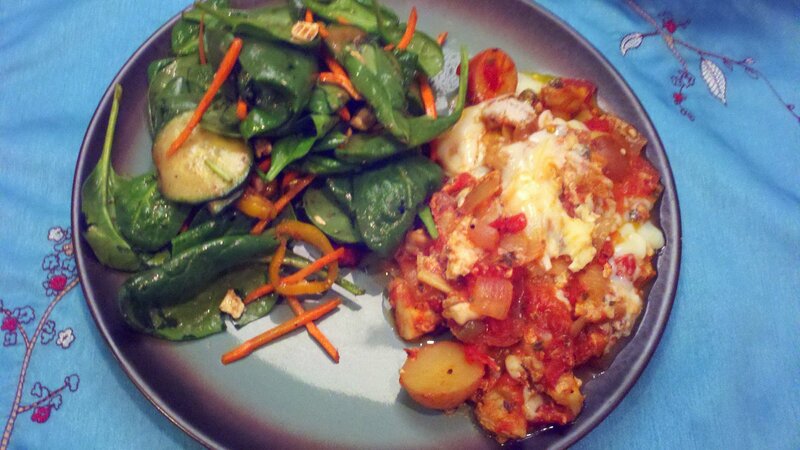 We had some leftover potatoes, so this hearty yet fairly healthy recipe for Eggs in Purgatory caught my eye. Weird name for a recipe, right? Uova in Purgatorio, the original Italian name, sounds less ominous but much harder to pronounce! This take on the Italian classic ditches most of the naughty carbs. Given the amount of prep needed (chopping onion, thyme and garlic; roasting potatoes, etc. ), this was not an ideal weeknight dinner. Since the hubby is at the Sugar Bowl (and enjoying dinner at Luke while I'm stuck cooking! ), little sister came over and waited a long, long time while I cooked. As you can see from the photo, this was not the most aesthetically pleasing dinner. It looked much better in the pan with the perfect runny eggs sitting on top, but it's not solid enough to scoop without breaking up. Some commenters on Epicurious had complained the recipe was bland, so I used Muir Glen fire roasted tomatoes with green chilies, which kicked things up nicely! What it lacked in beauty, it made up for in taste. Two changes I'd make in the future. First, if making for company, I'd make in individual ramekins so that the eggs wouldn't get broken during serving. Second, I'd only make this on a weekend since it clocked in at over an hour of work, which is no bueno for a work night. Note: The Muir Glen tomatoes used in this recipe were received gratis within the 2011 Reserve Gift Basket they provided me. The product was free but my affinity for them is genuine!